I’ve been doing a lot of reading lately and decided to share some of the books which have caught my fancy. I don’t keep up on the newest best sellers and have a tendency to allow books to find me by chance. Sometimes, the books I read have been in print for years and are so good they remain timeless. 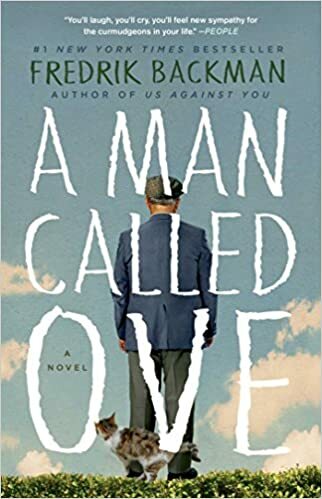 I recently read A Man Called Ove by Fredrik Backman, and it was one of the books added to my favorites. Ove is GRUMPY, cantankerous, and extremely particular. He is a strict rule-abider and expects everyone else to simply follow the same rules. When they don’t, he gets extremely irritated. Ove is determined to die, and his repeated attempts at suicide are waylaid by people who aren’t as rule-abiding as Ove. At first, I wasn’t sure if I could hang in long enough to develop a rapport with Ove as the main character; however, the onion started slowly peeling and layers and layers of his personality began to reveal themselves. I found myself falling in love with him. Ove overcame obstacles. He loved deeply. Ove’s strict adherence to right and wrong led him to some interesting choices and unlikely friends. I loved this book. It was well written and moved at a pleasant pace. The characters were easy to like and the growth throughout their struggles were realistic and true to life. I recommend this book to anyone willing to see beneath the surface of a person to get to the heart of what makes someone tick. It’s well worth the journey and might cause a tear or two. As an interesting side note, Tom Hanks bought the rights to A Man Called Ove and will be playing the beloved Ove as well as producing and directing the movie. I’m excited for the release next year. There is a Swedish version (subtitled) of the movie, also – A Man Called Ove. which I’ve not yet watched. I read the book a couple of years ago and my reaction was very similar to yours. The more I got to know Ove the more I liked him and the more it became clear that he was true to himself. We also saw the Swedish movie and found it as moving as the book. The subtitles did not get in the way. I’m not sure I look forward to a Tom Hanks version, this is a Swedish story. Hmmm, sound like something I would truly enjoy. I’ll have to look for it! I’ve seen this book around a lot but haven’t read it yet. It sounds like a good one for Tom Hanks to play. Nice to see you, Dawn. Miss you and hope that all is going well in your travels! I recently started reading fiction, having no use for it in the past. I’ve come to enjoy the lessons you can learn and just being able to take one’s mind away to another place. Thanks for the book recommendation. I sent it to my wife as well. So excited to read this book review. I’m always looking for interesting reads – not necessarily from the best seller lists! Thank you for sharing!